(Nanowerk News) Scientists at the U.S. Naval Research Laboratory (NRL) Materials Science and Technology Division have developed a novel one-step process using, for the first time in these types of syntheses, potassium superoxide (KO2) to rapidly form oxide nanoparticles from simple salt solutions in water. 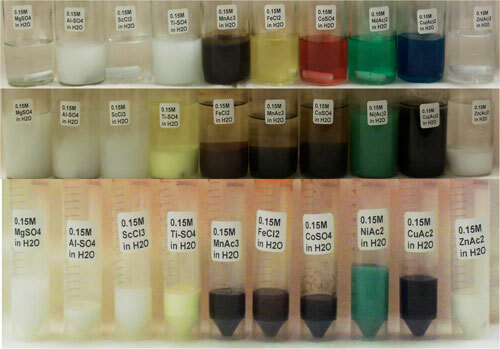 Oxide nanoparticles have been shown to be crucial components in numerous applications to include electronic and magnetic devices, energy storage and generation, and medical applications such as magnetic nanoparticles for use in magnetic resonance imaging (MRI). In all of these applications, particle size is critical to the utility and function of oxide nanoparticles—decreased particles size results in increased surface area, which can significantly improve the performance of the oxide nanoparticle. One exciting aspect of this technique is that it can also be used to produce blends of nanoparticles. This has been demonstrated by preparing more complex materials, such as lithium cobalt oxide—a cathode material for lithium batteries; bismuth manganese oxide—a multiferroic material; and a 90 degrees Kelvin (K) superconducting Yttrium barium copper oxide material. As such, this new synthetic route to oxide nanoparticles also shows great promise for a multitude of other catalytic, electrical, magnetic, or electrochemical processes, from novel cathodes to solution preparation of other types of ceramic materials.